Happy Friday the 13th! Finally getting a Friday the 13th in October is super exciting for us as horror fans! 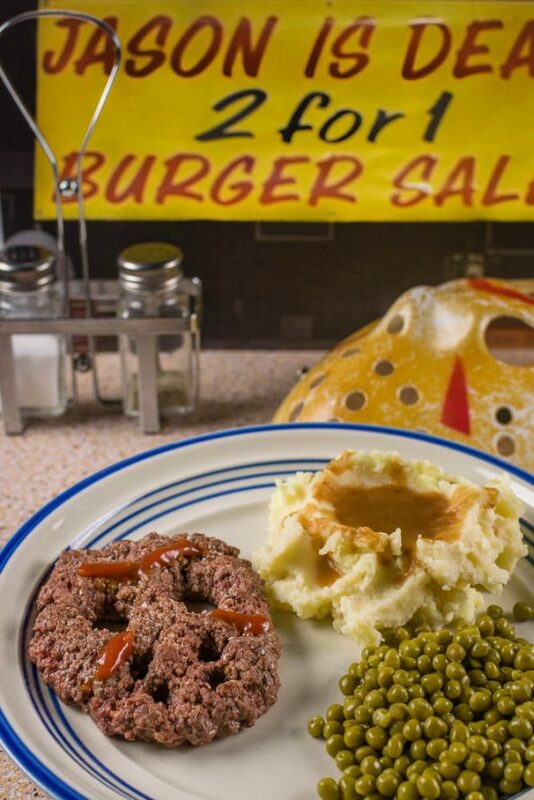 In fact, we were so excited that despite already having a Friday the 13th inspired recipe, we came up with a new one! This time, we took our inspiration from one of our favorite movies of the series, Jason Goes to Hell: The Final Friday. What inspiration could possibly come from this movie? Burgers. 2 for 1 Burgers as a matter of fact! The inspiration for our 2 for 1 Burgers comes directly from the movie. Believe it or not, they are actually made in the film! Really what it came down to, was that we wanted to see if they could actually be made. In the scene they are featured in you only see them in raw form. The results were in and they DO work. Realistically, they aren’t much more than your standard hamburger, but they sure do look fun and are perfect for a Halloween party! The only suggestion we really have with these are to use full fat ground beef to minimize the risk of them breaking. We hope you enjoyed our test of the 2 for 1 Burgers! Now, we’d love to know your favorite Friday the 13th film! Let us know in the comments below or tag us on social media! We’d love to hear from you! Happy Friday the 13th! 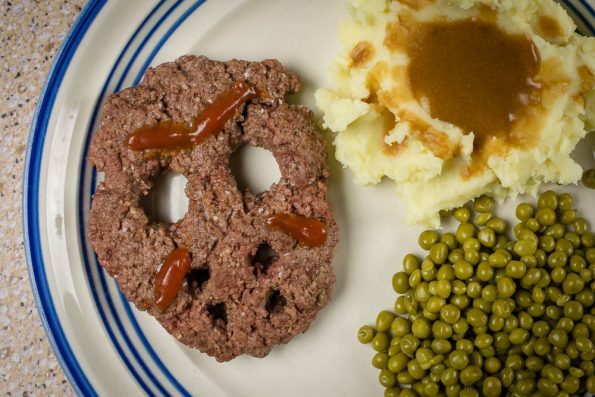 Shape your patty into the hockey mask shape on a piece of wax paper (this will help you transfer to the pan). You may want to flatten your patty fairly thin so it doesn't puff up as it cooks. Add the eye hole beef to the top of the mask to re-enforce it. Carefully add the shaped patty to skillet. Season the other side of the patty. Remove from skillet and let rest. Decorate the burgers with ketchup. Serve either as a hamburger steak or on a bun. Oh man, I can’t wait to try this, my husband loves Jason. The burgers were my favorite part of the movie. Not just because of the gimmick but it was surprisingly realistic. Many people tell you, whenever you cook a burger on a pan or a grill would tell you to cut into the burger first in one way or another, so it would better cook the meat internally as well as externally. Whereas here it’s the same principle but you’re having fun doing it. Now if only you guys knew how to make Jason Fingers. They’re obviously chicken fingers, but how would you shape the chicken and bread. In the shape of fake severed fingers? Or better yet miniature machetes to compliment the mask burger.